As our hop plants start reaching the top of the trellis my mind turns to my favorite time of year, wet hopped beer season! And no, not because wet hops are “easier” for our farm to sell, I get that joke all the time. It’s the draw of harmonious layers of subtle, yet complex hop character that can only be found in fresh hopped brews at harvest time, shining in a world of intensely hop forward beers, if only for a brief period of time. Under the best drying conditions hops lose many of their volatile oils that contribute to flavor and aroma, so with fresh hops, you’re starting from a place of “more.” Because the hops are still “wet” the effect is understated but ever-present; a brew that is multidimensional, with notes of grass, herbs and flowers mingling with the traditional hop characteristics you’ve grown to know and love. 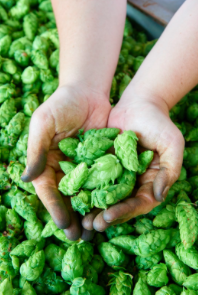 Historically, wet hopped beers were only made by those breweries that were either lucky enough to be proximate to hop farms or had the resources to fly in wet hops overnight. However, as more regions of the country start growing hops, access to fresh hops is changing - opening the door for more breweries (from the smallest to the largest) to make these seasonal gems. We’ve proudly watched the number of these brews across New England grow over the last several years. At the farm, we’re currently accepting pre-orders for this season’s wet hops. Our harvest will run from late August to mid September and each variety will be picked, one at a time, across that window. Centennial and Magnum always vie to be the first one’s harvested, Rakau is always last (typically ready after the first week in September), while Cascade, Pépite, Mt. Rainier, Chaos and Crystal hang tight in the middle. Adventurous brewers are welcome to pick up their orders and take full advantage of the view, photo op and story only a hop farm can provide. For those that can’t make it to the farm we can ship right to your door. Wondering how to procure some for your brew? It’s as easy as calling or emailing me. There’s a natural symbiosis between many brewers and farmers and this style of brewing showcases that relationship, highlighting the best of what the growing season has to offer, the talents of the brewer and giving a unique nod to time and place. These brews are special, they’re delicious, they’re fleeting, and I’m thankful there are more of them available locally every September.